Model 5500/5510 Mill - Millhill Supplies Ltd.
5500 is similar to the 5000 shown except for the addition of adjustable zero handwheels. The 5500-series mills are essentially a Model 5000-series mill upgraded to include adjustable “zero” handwheels in place of the standard non-resettable handwheels. 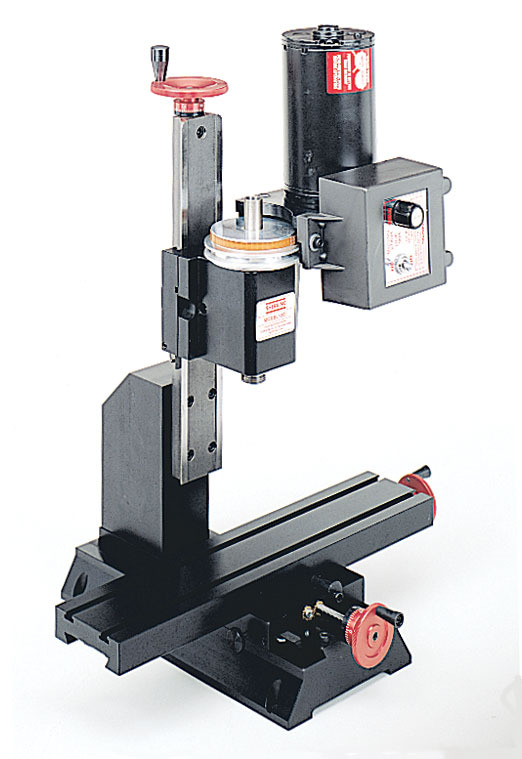 They feature the same solid 10″ (254mm) aluminum base, precision machined dovetailed slides with adjustable gibs, permanently lubricated spindle bearings, adjustable preload anti-backlash feed screws on the X- and Y-axes, and many other features found only on the best commercial machines. Adjustable zero handwheels allow the user to reset the handwheel to a zero reading at any time without moving the leadscrew. This makes dialing in the next dimension easier, as you are starting from zero each time. It also helps eliminate math errors. This is a feature normally found on expensive full-size machines, but not often available on a machine of this size and price. The 5500/5510 mill combines the compact size and economy of our basic mill with the luxury of adjustable handwheels.